Unclassifiable and Normalization QC failed samples are not shown in this plot. Boxes show the confidence interval for subgroup assignment generated by bootstrapping, and the individual data points represent the final probability associated with each subgroup call. 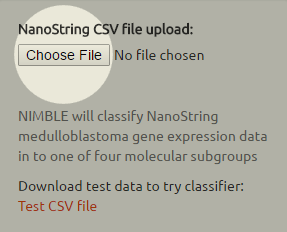 NIMBLE will classify nanoString medulloblastoma gene expression data into one of four molecular subgroups: WNT, SHH, Group 3 and Group 4. A multi-class optimised Support Vector Machine (SVM) validated and trained on our extensive RNA-seq medulloblastoma cohort is used to robustly assign a subgroup to samples by their 19 gene expression values. Our SVM is validated using a bootstrapping technique via 1,000 random iterations of 90% of the training set, confidence interval derived from this is plotted on the Classification Graph as a box plot. The final probability assignment for a subgroup call is made by creating an SVM model with the whole RNA-seq training set; these probabilities are given in the Classification Table in the initial tab. NIMBLE development was funded by a Cancer Research UK program grant. A Comma separated value (.csv) file produced by a nanoString assay is needed as input to use the classifier. If you would like to test drive the classifier, or would like to see how it should be formatted a test file can be downloaded using the link in the grey box on the left. 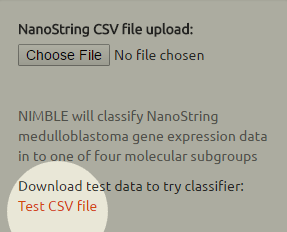 A nanoString .csv file can then be uploaded by clicking on the 'Choose File' or 'Browse...' (browser dependent) button on the left, once uploaded the classification happens automatically. Gene names we use are: DKK2, EMX2, GAD1, TNC, WIF1 (WNT subgroup genes), ATOH1, EYA1, HHIP, SFRP1 (SHH subgroup genes), GABRA5, IMPG2, MAB21L2, NPR3, NRL (Grp3 subgroup genes), EOMES, KCNA1, KHDRBS2, RBM24, UNC5D (Grp4 subgroup genes). If you have any issues with using NIMBLE please contact Reza Rafiee. WARNING: NIMBLE is for research use only, and should only be used on samples with a confirmed histopathological diagnosis of medulloblastoma.